Hi, and welcome to JT Hughes Hyundai here in Shrewsbury. My name's Rob. Just going to take you around this used Hyundai i30. This is the 1-litre Turbo petrol SE Nav model on a 17-plate, done just over 17,000 miles. So the i30 comes very well-equipped. You've got autonomous braking. You've got your LED daytime running lights, alloy wheels, body coloured mirrors, door handles. Around the back, we've got the rear parking sensors and parking camera. So we'll have a look inside the good-sized boot. As you can see, you've got 60/40 split rear seats for any larger items, a little ski hatch there for any long loads you wish to put in. Underneath the boot floor there, you've got your Space Saver spare wheel. You've also got a power socket and courtesy light in the boot as well. If we move into the rear passenger compartment, as you can see, very roomy indeed, loads of leg and headroom. You've got three full seatbelts, ISOFIX fittings on the two outer seats. You've also got your centre armrest there with a couple of cupholders. And that's the ski hatch I spoke about, where obviously, you're through into the boot. Pockets on the back of the front seats for additional storage, and electric windows in the rear, as well. 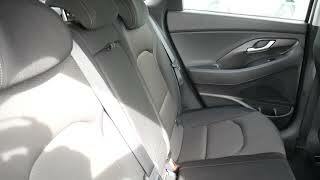 And if we move into the front, again, nicely shaped, supportive front seats. As you can see, nice cloth upholstery throughout, height-adjustable driver's seat, together with electric lumbar adjustment. Centre armrest there with some storage inside, a couple of cupholders, 6-speed manual gearbox. You've got USB, auxiliary input, a couple of power sockets, and a wireless charging area for a phone, air conditioning. You've got your digital radio, satellite navigation, rear parking camera screen. You've got your auto-dimming rear-view mirror. You've also got Apple Carplay, Android Auto. Lane Departure, Lane Assist, all standard, as is Traction Stability. On and around the steering wheel, you've got your cruise control speed limiter. You've got your trip computer buttons. You've got your audio controls, Bluetooth for your phone, so everything's really nicely at hand. Auto lights as standard, as is auto high-beam. In the driver's armrest, you've got controls for all the electric windows and the electrically adjustable and retractable door mirrors. Now, this car will come with the remainder of the five-year, unlimited mileage warranty from the date of first registration, and that also includes your AA Five Star cover. That's your Homestar to Relay Recovery, again for the remainder of that warranty period. If you'd like any further information, or if you'd like to arrange a test drive, then please contact JT Hughes Hyundai Shrewsbury on 01743 450888.